There's a new season of Below Deck on its way, and you know what that means: Another mega yacht to drool over while dreaming of sipping freshly made drinks instead of sitting at home on your couch. And, of course, the reality check when you realize just how much it costs to rent the Below Deck: Mediterranean ship: The Ionian Princess. The yachties over at Yacht Charter Fleet said that a week on the IP in the summer will cost you $163,501, but the experts at Fraser Yachts quote a slightly higher measurement — up to $185,972 a week in the summer. Want to save a few bucks? You can travel in the winter, when the cost is less exorbitant, just $140,087 according to YCF as opposed to Fraser's $163,430. 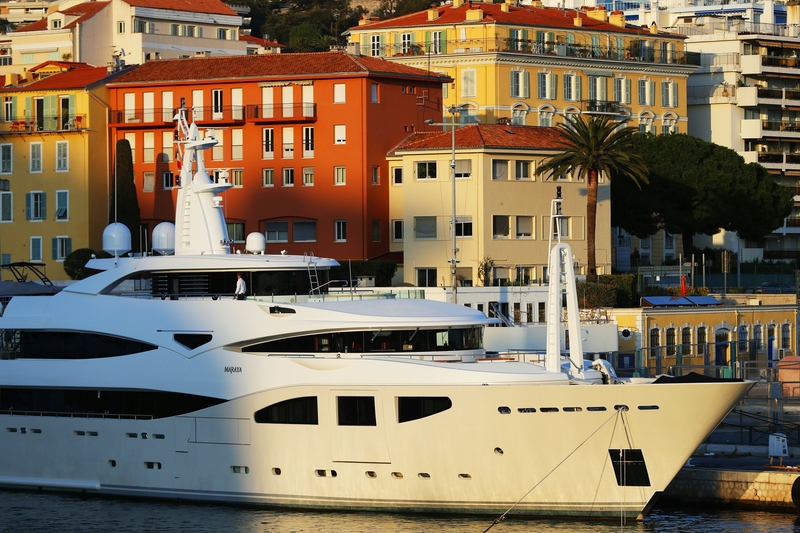 Either way, you probably need to be an actual millionaire in order to go on a month-long charter trip through the Mediterranean. I hope that doesn't come as a shock, because is anyone surprised that the yachts seen on Below Deck are expensive? Come on, if a sweatshirt from the Kanye collection is hundreds of dollars, then it should be no surprise that the vacations that Beyonce takes cost in the hundreds of thousands of dollars. But, you're getting your money's worth when you rent the Ionian Princess. Maybe not literally, unless you happen to be chartering the ship when the Bravo cameras are present, but YCF says that the yacht carries up to ten crew members. That means ten people will be working 24/7 in order to insure that you don't have to lift a finger for the tenure of your stay... that is, so long as you leave them a good tip afterwards. According to its website, the accommodations on the Ionian Princess include room for 12 people, split into six rooms. And there's two master suites, so no need to argue about who gets to stay in the biggest room. The IP is 150 feet long, according to Yachting magazine. To put that into perspective, the Ionian Princess is almost as long as the Tower of Pisa is tall. So, even though there's a lot of people on board, you really don't have to see them if you don't want to. Yacht Charter Fleet has a list of the activities that you can do while sailing on the Ionian Princess, and they're awesome. Jet skis, kayaks, snorkels, wakeboards, waveriders, waterskis. Not mentioned: A giant rubber slide, unfortunately. I guess that's Below Deck classic-only. That's for the best, really, since the on deck hot tub always tends to get a lot of use as the season goes along. And, the crew loves to take their turn in the jacuzzi. Captain Lee always seemed a bit awkward, but maybe the new Mediterranean captain will be more chill. The Caribbean yachts were a bit more relaxed and beachy compared to the Ionian Princess, which will be bringing some ornate European flair, like this glass window design. But, if you need more convincing of why this yacht is first class in luxury, tune in to Below Deck: Mediterranean on May 3.